Rhetta Riggs still has the most engaging, expressive eyes and smile and warmth that fills a room. 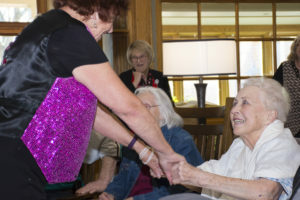 Her eyes sparkled as she enjoyed a personal performance by her former dance troupe at Ohio’s Hospice of Dayton. It was obvious she would have loved to be able to leap from her chair and join the Kettering Kickers in their lively performance. Rhetta enjoyed a 38-year career at Wright Patterson Air Force Base, but her passion was for dance – in particular, the hula. “I love it because it’s dance that tells stories,” she explains. Her love for Hawaiian folklore and dance eventually extended to playing steel guitar and traveling to perform in Hawaii every two years. 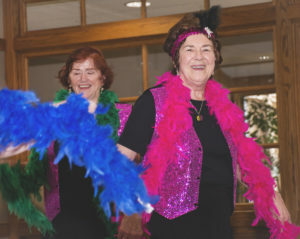 For three decades Rhetta kicked up her heels and participated in the Kettering Kickers performances to old-time classics and familiar pop tunes. 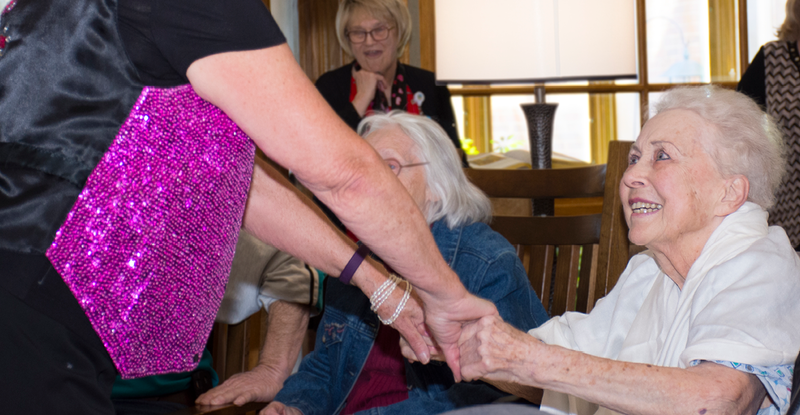 Hearing Rhetta was receiving care at the Ohio’s Hospice of Dayton Hospice House, her former dance mates decided to bring their show to her. Hospice staff members and passers-by who were intrigued by the music and joyous performance of the Kettering Kickers joined Rhetta’s family members. Rhetta mimicked their moves from the sidelines this time, but it was clear her heart was with them in synchronized beat, her eyes sparkling and her smile contagious.